The Venice Carnival is perhaps the most anticipated event of the year in the city and is a spectacle that is famous and appreciated all over the world. Every year thousands and thousands of tourists arrive in the lagoon to enjoy this unique event whose roots go back centuries. The first evidence of the event dates back to 1296, when the day preceding the period of Lent was established as a holiday. The meaning of the holiday is easily explained. Carnival was the occasion in which, for a brief period of time, the distance between the humblest and the more affluent classes of society were erased. With the help of disguises and masks, Carnival was a holiday dedicated to the amusement of the entire population. Over time rules were imposed because behind the masks it was difficult to tell the difference between the innocent pleasure seekers and the evildoers who committed dangerous misdeeds. The extravagances had to be regulated in some way. 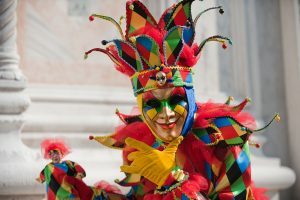 For a long time, the tradition of the Carnival fell out of fashion and it wasn’t until the late ’70s that the tradition of the holiday made a comeback, thanks to the support of tourist institutions, the Teatro La Fenice and the Venice Biennale, who saw this holiday celebration as an opportunity to bring prestige to the city. The oldest and most widespread mask in the past was the Baùta, made from a long cloak, a tricorn hat and a white mask, partially misshapen, that completely covered the face. It was practically impossible to understand who was behind the disguise. The most recurrent and well-known disguises are undoubtedly: Harlequin, with his patchwork costume, a little mischievous and always cheerful; Colombina, his fiancee, a shrewd servant who is constantly pursued by Pantalone , an old miser and astute trader, who defines himself as the merchant of the city. The other traditional disguises are most varied: the bizarre plague Doctor, recognizable by the long nose shaped like a stork’s beak, Brighella, with the green and white striped costume, and Mattaccino, the clown who throws eggs stuffed with perfume from the balconies of the city. The Mascareri (mask-makers) and the commerce in masks became true professions that brought revenue to the city. 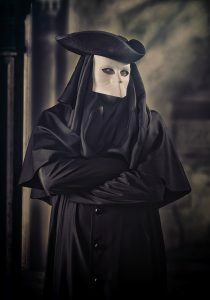 When is Carnival in Venice this year? The 2019 edition will take place from February 16th to March 5th, and the most anticipated event is undoubtedly the Angel’s Flight during the Venice Carnival. 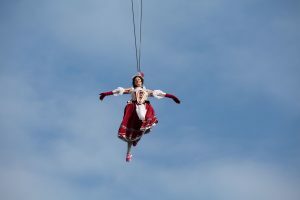 During the second Sunday of Carnival, the winner of the previous edition of the Feast of the Marie (during which the most beautiful girls in the city are awarded) flies over Piazza San Marco attached to a cable from the bell tower to the Palazzo Ducale. It is a highly popular event, and the last edition registered over 40,000 visitors. There are hundreds of shows and theatrical performances in museums, competitions to elect the most beautiful mask, parades on the water and many events where fantasy and dreams meet in one of the most beautiful cities in the world. And you can’t miss the most glamorous moment of the entire Carnival. We’re talking about “The Official Dinner Show and Ball” where food and entertainment come together for an extraordinary evening: 5 courses, spiced up with shows, games and performances among the tables, music and DJ sets for an evening that you will never forget. 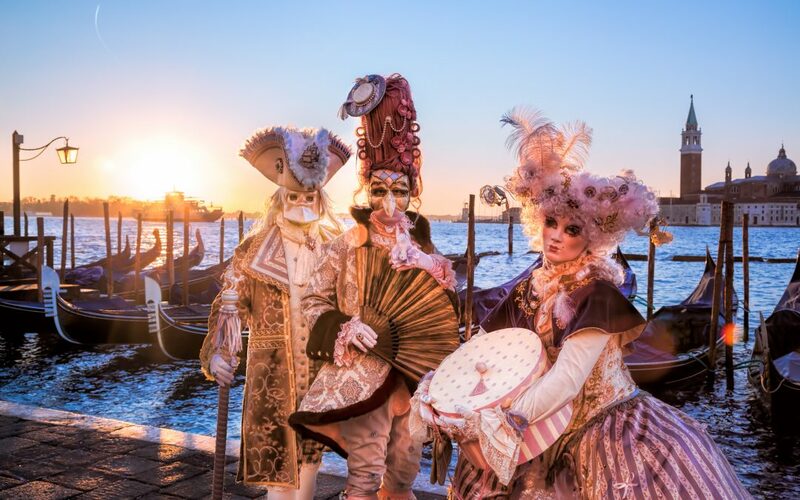 Each edition of the Carnival Ball offers unique emotions that take its spectators to a magical world of the imagination: how about booking your tour in Venice during the Carnival period and making your trip to Italy unforgettable? Discover all the best options to personalize your trip with Dragonfly Tours!